V.I.P. (Vulcan Is Prissy) Sarek comes aboard the Enterprise to criticize their drapes in preparation for an assuredly sumptuous treaty-making soiree (which we never actually get to see; extras cost money, alright?) with a never before seen alien species (err, make that never seen all episode; make-up costs money, alright?) and needs a little something to steady his nerves before the big night. Turns out he's going senile and in danger of losing his stoic Vulcan emotional control. Most people would settle for a shot or three of whiskey, but Vulcans apparently would rather dump their butterflies into someone else's stomach. ... As disgusting as that sounds, it's not half as invasive as telepathy. Very little of this episode makes sense. First off, if Sarek was broadcasting emotions at such a decibel level as to affect regular humans all over the ship, he should've rocked Troi's sonar like a marching band. Also, of all crew members to potentially have their mind shattered by an unspeakably intimate sharing of neural pathways, there must have been hundreds more expendable than the freaking captain of the ship! Maybe you need the right mind for it... but then why a non-telepathic Homo mundanicus whom you've just met days ago? 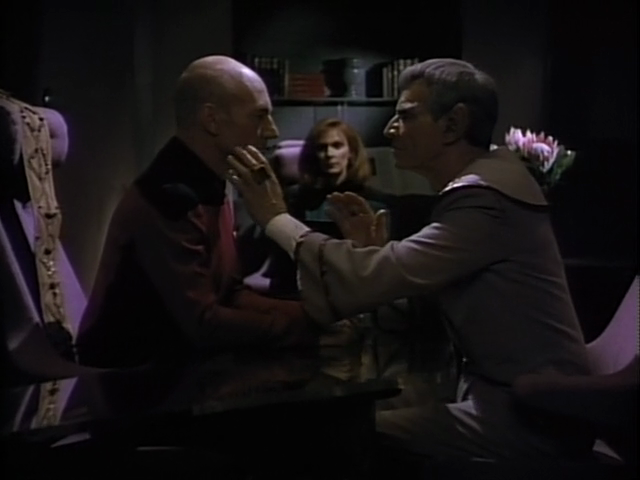 Why not Sarek's younger Vulcan assistant, who's already been telepathically linked to him for months? years? Why not his wife? After all, it's her job to mentally castrate him. Or maybe the other assistant, a close confidant of years past? Why not Troi, y'know, the ship's official telepath? What do you even keep her around for if not to mind-meld with ambassadors? Eh. Fans probably find it easy to forgive such trespasses and get drawn into the acting instead. Stewart was at his usual best, both cold-bloodedly confronting his social better and hamming up his newfound Vulcan emotions after the mind meld. The portrayal of Sarek also manages to keep up with the show's resident Shakespearean, unlike many guest stars. This one's about an amnesiac mutant alien messiah. But first, let's spend a few minutes ridiculing Geordi some more for being despised by women, after he already absorbed Wesley's insults about it in the previous episode under Sarek's influence. No, no, really, it's okay, because after getting brain-zapped by the A.M.A.M., he finally works up the courage to subject his self-worth to a woman's judgment. He thanks the A.M.A.M. profusely for this gift of slavishness by the end of the episode, instead of asking the obvious question: "did you or did you not give me brain cancer?" Meet the Amnesiac Mutant Alien Messiah, and his Amnesiac Mutant Alien crotch bulge. He suffers from hot flashes. Apotheotic hot flashes! As should happen, his entire species is primed to transcend their physical form, but a shadowy (everything's shadowy in space) government conspiracy keeping the wrapture under raps keeps killing off all the incipient godlings. Boy, ain't that always the way? Luckily, it only takes one fully actualized A.M.A.M. to infect the whole population with divinity, and if you think this story's beginning to sound familiar, then you must be an A.C. Clarke fan. Most action / drama TV shows tend toward villains of the week. The original series of Star Trek certainly did. TNG, given its greater emphasis on a polite, utopian society, tended rather toward heroes of the week, introducing positive episodic characters helping to solve a particular technological / astronomic mystery. Unfortunately Science Fiction doesn't really thrive on characters, but rather on ideas. Transfigurations subjects you to an utterly forgettable string of cheesy, sappy commentary on the A.M.A.M. 's virtues, going nowhere until the entire backstory gets breathlessly exposited in the last five minutes. Even lifting your basic plot from one of SF's "big three" doesn't amount to much if you cram it into the end credits. Not much in the way of boldly going. Sarek fares a bit better, but ultimately resolves to "the one with Spock's dad" and some palatable thespianing. Hard to classify either of these episodes as anything other than filler. Having some schmuck stand around expositing is cheaper and more audience-friendly (read:idiot-friendly) than actually playing out a true SF plot with all the bells and whistles. You can get a lot of "futuristic" mileage out of some chin putty and a leotard, and telepathy's always very budget conscious, depending as it does on the "special" effect of actors squinting and grunting at each other.